It is quite rare that a vendor sells pre-cut and annealed glass tube exactly to the size you require. Most vendors only supply glass tube in their preferred bulk lengths which invariably does not suit you, which means buying a longer tube and cutting it yourself! This is not overly difficult in most cases. Glass is a fragile and brittle substance wihich can break easily resulting in slivers and shards. Some safety equipment is very highly recommended. Safety glasses are not just a luxury, they are required. There is always a risk of glass shattering. Any glasses or goggles suitable for grinder sparks are adequate. Gloves are recommended, and should be of thin leather for sensitivity of touch, and to protect against accidental burns by picking up hot glass when annealing. 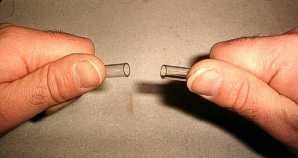 There are two common ways to cut glass tubing. 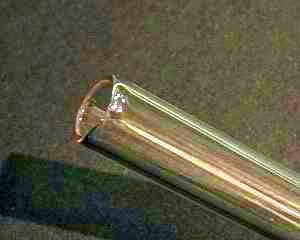 The techniques are the same whether you are cutting clear glass or Schellbach (white/colour striped) tube. The one most people use for smaller diameters (up to about 7mm OD) is the score and snap method. The technique is quite simple in principle, but needs practice to achieve good results. Steady the tube on a flat surface with one hand. 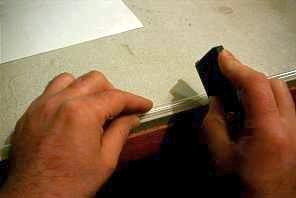 A notch (just a scratch is enough) is made with a suitable tool on the tube at the point where you want to cut the tube. It is best to score across the tube just once. It should not be sawn back and forth. One sharp scratch is sufficient. The scratch should be 3 to 4mm long and at right angles to the tube. Suitable tools are window glass cutters, so-called glass knives [Steelite(R) blade], diamond knives, or even a new three cornered file. 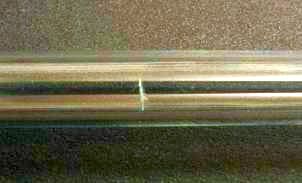 The tube is then snapped at the scratched point by holding your forefingers on the tube at the points indicated on the drawing, gently apply pressure opposite the notch with both thumbs (thumbs should be nearly touching ); the glass will snap very cleanly. Snap the tube by applying a VERY slight bending action away from your body, and gently pulling the tube as if to stretch it at the same time. The tube should snap quite easily, with a satisfying 'click'. Bare hands are fine, but the use of thin leather gloves may be a wise safety precaution, as well as protective eye glasses or goggles. The tube should be supported so that absolutely no bending forces affect the tube while it is being scored. When snapping the tube it should be held so that your thumbs meet exactly opposite the scored mark. Refer to the diagram at above left showing the score, your thumbs should be where the arrows in the picture are. As you snap the tube do this by applying a VERY slight bending action away from your body. The tube should snap quite easily. The other common way is to use some sort of cut-off wheel. This can be used on any diameter tube up to about 35mm. Any wheel containing an abrasive harder than glass will do. The finer the abrasive and the thinner the wheel the better the job you will do. If the wheel is too small to transect the tube, then the tube should be rotated against the direction of the spinning wheel. Some people have suggested putting the job in a lathe to hold the tube. This will work but the glass MUST be protected from direct contact with the metal jaws of the lathe. Anything with a bit of 'give' will do as long as it is held concentrically. Glass blower's lathes have a modified three jawed chuck with the jaws wrapped in fibreglass cloth. Once you have cut the tube it still will be almost certainly not be square enough for some purposes. You could use an abrasive wheel (180 grit or finer) using v-e-r-y gentle and careful pressure, but you can get a better result with a piece of carbide paper/cloth on a hard flat surface. Simply hold the tube square to the flat surface and lightly rub the glass against the abrasive surface. A little water will help prevent clogging abrasive cloth. After the tube is cut, whether by score and snap or by using a cutting wheel, there's still one very important thing to do: Fire polishing (or annealing) the finished tube is extremely important, this makes it stronger and safer, and removes any sharp edges. It stress relieves the glass which may otherwise lead to a fracture during use at a later time. It also slightly rounds the ends, which prevents damage to seals such as O-rings while inserting the tube into the gauge assembly. This is easily done with a clear flame (no yellowness at all to it, oxy-gas or air-acetylene) by v-e-r-y gently passing the cut end through the flame until you see the sharp edge just start to round over. Rotating the glass whist in the flame helps an even heat. Glass has a very narrow solidus-liquidus range so it really shifts once it starts moving. Leave in the flame only long enough for it to soften. 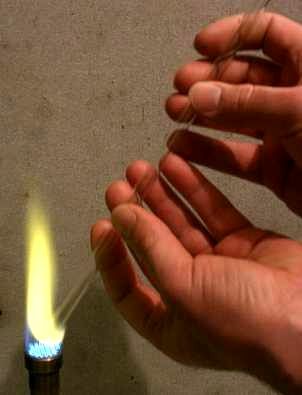 Leave in the flame for too long and the tube will slump and bend or collapse. The glass edge melts ever so slightly, leaving a nice, smooth, rounded stronger edge. A few tries will get it perfect. Work on a firm surface that will resist burns from hot glass. Metal bench tops are a problem because tiny bits of swarf can scratch glass and weaken it. After all cutting glass is controlled scratching. And the end of the tube after it has been rounded over (at right). It is now stronger and safer to handle. The cut and annealed tube of the desired length is now ready for installation. Incorporated in this page is additional material from Hugh Goff, a professional chemist who had to make his own laboratory glassware, and went on to learn techniques from professional scientific glassblowers. Some content on this page is copied from www.rhunt.f9.co.uk/Glass_Blowing/Cutting_Tubes/Cutting_Tubes_Page1.htm and is used here only to maintain page styling, and guard against that site possibly becoming unavailable in the future. 82 Text and photos Copyright © 2006-2019 SMEX, All rights reserved.